For the last thirty years I have been giving myself a College Education. If I show anger towards people I know, and those who have gotten to know me, it is they think I am mad to study all by myself. Thanks to the DNA TEST I took at Ancestry.com, I have not been – that alone! I have been – compelled, driven by unseen forces I could not elude! I did not knowwwwwwww, better! Richard Burton and Liz Burton suffered from the disease of alcoholism, thus, it is wondered how much more stellar their careers would have been if they did not drink. A bad biography about my famous sister, the artist ‘Rosamond’, wonders the same. There is no wonderment about me, because in many people’s mind, I never had a career! Yet, I own thirty-one years of sobriety on April 7th. There is a very good chance John Harvard knew my great, great, great, great, grandfather, Reverend John Wilson. Both men wondered if the wonderful things they had done, would be remembered by their offspring – years from now. I have been given such concerns, but, I think the buck stops here. I carry on! Some of you have heard me rant about ‘My Dumb Daughter’ which might become a play, or, an epic poem. I know many people can relate. ‘The Taming of the Un-Shrewd’? I will explore the claim, that it wassssss – Reverend John Wilson who founded Harvard. He certainly had the pedigree! His son graduated from Harvard in 1642. John Harvard was born in Stratford-On-Avon, and may have known the Webb family, which is the only family line one can trace in order to be kin to William ‘The Bard’ for his three daughters, died. And, thus is comes down to me to carry on any and all family feuds? Of course! That makes sense, as to why I am tooooo clever to be in the good company of – anyone! So, I study…………alone! There will be no crappy folding chairs put out on the lawn for my happy relatives who can’t wait to see what is coming to me. I have already got what I deserve! I just heard that Harry and Markle are going to have a child in a few days. I feel this is my Graduation Day: for when they married in Saint George’s Cathedral, they took their vows not but ten feet away from where the bones of Reverend William Wilson, lie, under the cold granite, under a brass plaque, just he, and his wife, a great, great, grandmother to me. So, it was God who kept calling to me, when it was my ambition to be a Drunken Scallywag, blinded on the squiggly road taken by the infamous, to ne’er land. I was a better and more loved Smartass when I had a bartender tending to all my ambitions. Rev. John Wilson was born in London, England, Sept. 1621, and came with his father to New England in 1630. He graduated from Harvard College in 1642, and was ordained and settled with Mr. Mather at Dorchester. In 1651 he removed to Medfield, Mass., where he became a famous preacher, and remained there until his death in 1691. He died at Medfield, Mass., Aug. 23, 1691. She died at Braintree, Mass., Aug. 20,1725. This article is about the founder of Harvard College. For John Harvard, the statue in Harvard Yard, see John Harvard (statue). For other uses, see John Harvard (disambiguation). John Harvard (1607–1638) was an English minister in America, “a godly gentleman and a lover of learning” whose deathbed bequest to the “schoale or Colledge” founded two years earlier by the Massachusetts Bay Colony was so gratefully received that it was consequently ordered “that the Colledge agreed upon formerly to bee built at Cambridg shalbee called Harvard Colledge.” The institution considers him the most honored of its founders – those whose efforts and contributions in its early days “ensure[d] its permanence,” and a statue in his honor is a prominent feature of Harvard Yard. Harvard was born and raised in Southwark, Surrey, England, (now part of London), the fourth of nine children of Robert Harvard (1562–1625), a butcher and tavern owner, and his wife Katherine Rogers (1584–1635), a native of Stratford-upon-Avon whose father, Thomas Rogers (1540–1611), was an associate of Shakespeare’s father (both served on the borough corporation’s council). Harvard was baptised in the parish church of St Saviour’s (now Southwark Cathedral) and attended St Saviour’s Grammar School, where his father was a member of the governing body and a warden of the Parish Church. In 1625, bubonic plague reduced the immediate family to only John, his brother Thomas, and their mother. Katherine was soon remarried‍—‌firstly in 1626 to John Elletson (1580–1626), who died within a few months, then (1627) to Richard Yearwood (1580–1632). She died in 1635, Thomas in 1637. Left with some property, Harvard’s mother was able to send him to Emmanuel College, Cambridge, where he earned his B.A. in 1632 and M.A. in 1635, and was subsequently ordained a dissenting minister. In 1636, Harvard married Ann Sadler (1614–55) of Ringmer, sister of his college classmate John Sadler, at St Michael the Archangel Church, in the parish of South Malling, Lewes, East Sussex. He built his house on Country Road (later Market Street and now Main Street), next to Gravel Lane, a site that is now Harvard Mall. Harvard’s orchard extended up the hill behind his house. On 14 September 1638, Harvard died of tuberculosis and was buried at Charlestown’s Phipps Street Burying Ground. In 1828, Harvard University alumni erected a granite monument to his memory there, his original stone having disappeared during the American Revolution. 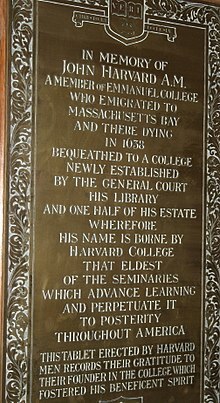 The quibble over the question whether John Harvard was entitled to be called the Founder of Harvard College seems to me one of the least profitable. The destruc­tion of myths is a legiti­mate sport, but its only justifica­tion is the establish­ment of truth in place of error. If the founding of a universi­ty must be dated to a split second of time, then the founding of Harvard should perhaps be fixed by the fall of the presi­dent’s gavel in announc­ing the passage of the vote of October 28, 1636. But if the founding is to be regarded as a process rather than as a single event [then John Harvard, by virtue of his bequest “at the very threshold of the College’s existence and going further than any other contribu­tion made up to that time to ensure its permanence”] is clearly entitled to be consid­ered a founder. The General Court … acknowl­edged the fact by bestowing his name on the College. This was almost two years before the first President took office and four years before the first students were graduated. These are all familiar facts and it is well that they should be understood by the sons of Harvard. There is no myth to be destroyed. 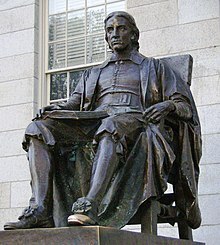 A statue in Harvard’s honor—not, however, a likeness of him, there being nothing to indicate what he had looked like—is a prominent feature of Harvard Yard (see John Harvard statue) and was featured on a 1986 stamp, part of the United States Postal Service’s Great Americans series. 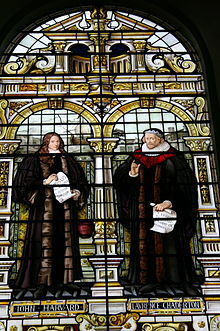 A figure representing him also appears in a stained-glass window in the chapel of Emmanuel College, University of Cambridge. The John Harvard Library in Southwark, London, is named in Harvard’s honor, as is the Harvard Bridge that connects Boston to Cambridge. There is a memorial window in his honor in Southwark Cathedral. Reverend William Wilson born 1542 Doctorate of Divinity and graduate of Merton College, Oxford BA in 1564, MA in 1570, BD in 1576, DD 1607. Rector of Islip, Oxfordshire, 1578; rector of Cliffe, co. Kent 1579, rector of Caxton, co. Kent, 1593, prebendary of St. Paul’s London 1595-1615, and of Rochester Cathedral 1591-1614. About 1580 he became chaplair to Edmund Grindll, Archbishop of Canterbury, and in 1583 became the canon of Windsor, holding his position for thirty two years until his death Mary 15, 1615 at age 73, he was buried in the chapel of St.George, Windsor Castle, where a monumental brass to his memory states that he was “beloved of all in his Life, and much lamented in his Death.” (Alumni Oxoniensis, vol. iv, p. 1657; Ashmole’s ‘History and Antiquities of Berkshire’ p. 305; register, ante, vol. xxxviii, pp 306-308, and vol. lii, p. 144). He married first about 1575, Isabel, daughter of John Woodhall, Esq., of Walden, co Essex, by Elizabeth his wife, sister of Rev. Edmund Grindall, the celebrated Puritan Archbishop of Canterbury, described by Lord Bacon as ‘the gravest and greatest prelate of the land.” (Register, ante, vol. xxxviii,pp.301-308). He married second, Anne, sister of Rev. Erasmus Webb, canon of Windsor, who died in 1612, without issue. (Register, ante, vol. lii,pp 143-4). He was a prebend of St. Paul’s of Rochester and of Windsor, and rector of Cliffe. Notes from the Antiquities of Berkshire, by Elias Ashmole, Esq (Reading, 1736) give the inscriptions found by that famous antiquary in the Chapel of St. George, Windsor Castle, relating to this family. On the North side lied a grave stone, on which, in Brass Plates, is the figure of a Man, and this Inscription “To me to live is Christ, and to dye is Gain.” Phillip I.21. Here underneath lied interr’d the Body of William Wilson, Doctour of Divinitie, and Prebendarie of this Church by the space of 32 years. He had issue by Isabell Woodhall Wilson six sons and six daughters. He dy’d the 15th of May, in the year of our Lord 1615, of his age of 73. ‘Who thinke of Death in lyfe, can never dye, but mount through Faith, from Earth to heavenly pleasure, weep then no more, though her his body lye, his Doul’s possest of never ending Treasure.” On another small brass plate on the same grave stone, is the following inscription. ‘Neere unto this place lyes buried William Willson, the third son, who after along trial of grievous sickness, did comfortably yield up his spirit in the yeare of our Lord 1610, of his age of 23. On a brass plate, on a grave stone northward of the last is this inscription, ‘William Wilson, late of Wellsbourne, in the County of Lincolne, Gent, departed this Lyfe, within the castle of Windosre, in the yeare of our Lord 1587, the 27 day of August, and lyeth buried in this place.’ p. 309. Arms of Will’m Wilson of Welborne, per Norroy flower, 1586. ‘Per pale argen and azure three lion’s gambs barways, erased and counterchanged. Crest:-a lion’s head erased argent guttee de sang. Harleian Coll., No. 1550, Fol. 192, British Museum: Richard Mundy’s copy of the Visitation of Lincolnshire, 1564 and 1592. A COPY OF VERSES Made by that Reverend Man of God Mr. John Wilson, Pastor to the first Church in Boston; On the sudden Death of MR. Joseph Brisco, Who was translated from Earth to Heaven Jan. 1. 1657. Though he hath left his dear Relations here. As Job his Friends did stumble at his Fate. And now I do of joyes eternal tast. And sure to live with Christ eternally.